Source: Doyle, A.C. (1917). His Last Bow: A Reminiscence of Sherlock Holmes. New York: George H. Doran. Miss Cushing receives a parcel in the mail that contains two severed human ears and Sherlock Holmes helps to crack the case involving her sister. Watson and Holmes go to Cornwall where a man needs his help in solving a mystery concerning his two mad brothers and his dead sister. "The Adventure of the Bruce-Partington Plans, Part 1"
Holmes’s brother visits him and tells him that three pages of the secret submarine plans are missing. The rest of the papers were found with the body of Arthur Cadogen West, however the three missing could enable an enemy to construct the submarine. A continuation of the previous story in which Holmes’s brother visits him and tells him that three pages of the secret submarine plans are missing. The rest of the papers were found with the body of Arthur Cadogen West, however the three missing could enable an enemy to construct the submarine. Doyle, Arthur Conan. His Last Bow: A Reminiscence of Sherlock Holmes. Lit2Go Edition. 1917. Web. <https://etc.usf.edu/lit2go/102/his-last-bow-a-reminiscence-of-sherlock-holmes/>. April 19, 2019. 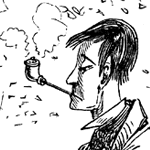 Arthur Conan Doyle, His Last Bow: A Reminiscence of Sherlock Holmes, Li2Go edition, (1917), accessed April 19, 2019, https://etc.usf.edu/lit2go/102/his-last-bow-a-reminiscence-of-sherlock-holmes/.